Well, a little information about me may be appropriate, I suppose .. I've lived in Michigan all my life, and in Petoskey since 1979, and have done tech support for Gaslight Media .. an Internet web development and Service Provider company in Petoskey, Michigan ... for the last 10+ years. In my 'spare' time, I have a German 'Oom-Pah' band in the area, that I play tenorhorn and the Steirische Harmonika (old style diatonic button box from Austria). The band is called "da Li'l Oom-Pah Band". More information can be found at my YOURAccordion.com site. We have also been working on a 'lighter' group, called "Cedar Creek Tanzlmusi", with a Steirische Harmonika, guitar, and perhaps a hackbrett (hammered dulcimer) and/or clarinet. Repairing Steirische Harmonikas (and occasionally, 'regular' accordions as well), is another ongoing project, along with a web site for information, music, and Griffschrift training books for the Steirische Harmonika. 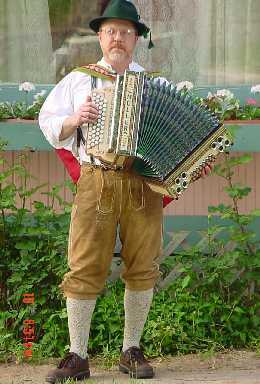 See YOURAccordion.com for more information. The last few years, I have been making family Christmas presents via different craft mediums, working mostly with wood, leather, and deer/elk antler. Several items have been made for club presentations for the Edelweiss group as well. So, what does all this have to do with Bavarian Crafts?? Well, as you can tell by the information above, you could probably say I'm a bit of a fanatic, when it comes to Bavarian music and culture .. and doing hand crafts. I've decided to put it all together, and make Bavarian flavored craft items for consignment, to help cover expenses ... for all the above hobbies! :-) You can find examples of the above items in the Photos area of this site, and probably more at http://www.YOURAccordion.com/images. If you have any questions about me, my interests, sites, or crafts, please fill out the form below and click "Submit." I will get back to you as soon as possible! I often get asked what types of tools I use for my various projects. Some call my woodburning pyrography, but, I consider that style usually a lighter touch .. more like painting wood. Although I certainly feather and tint wood with special tips, most of my work has more of an 'edge' than what I usually see in pyrography. My 'burner' controller Is a Colwood Super Pro II, with their replaceable tips. Several tips are used, but the one I use most ist a RT-M Micro tip, that I keep sharpened to a knife edge... so much of the 'burning' is actually 'cutting' as well. Usually, I coat my burns with one or two coats of tung oil, shellac, or 'Good Stuff, a food grade finish, sold by our local Michigan Maple Block. For the antler carving, bulk material is removed with a small Dremel-type rotary tool. I've about worn out the one I use, and it's not made any more, so I will be looking for a reasonably priced one, but with enough 'oomph' to keep up! Fine detail work is done with a TurboCarver. Tips for this carver are often 1/2 the size of Dremel-type tools. This is an air driven 'turbine' carver, that turns at up to 400,000 rpm.